After a train journey and taxi we were soon at at the Ohau road-end where we discovered that Murray's torch did not work. Murray being from a tramping club named after such a fine range of mountains would have been perfectly fine without the sense of sight I'm sure. Regardless of this our efforts began to repair his torch. Somehow a shred of paper had managed to get jammed deep within its barrel, and as paper does not conduct electricity prevented the batteries from touching the contact points to power the torch. After trying various objects to remove the paper from keys to twigs to walking poles, a loose piece of No.8 wire was found and did the trick, genuine kiwi style. Meanwhile, on behalf of Placemakers Alistair was busy marketing his $9.95 head torch. 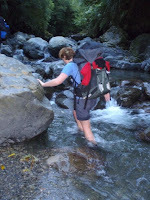 After an amazing 25 minutes of faffing we began walking our way along the track up the Ohau river and quickly found out way to a brillant campsite in a little under an hour. It was a beautiful night so there was no need to pitch our flys and we slept under the trees to avoid any dew. Come 5:30am, Craig instantly arose to fulfill his duty as trip leader and get the brew. We were on our way up the Ohau river by 6:30am. Our feet were wet well before 7am as we followed this scenic route up to the site of the new South Ohau Hut (currently under construction). We spent a small amount of time talking to the builders and began our ascent up the steep Yeates 500 with a startled look "Tarn Ridge tonight? You're keen". Following a steep 500ft ascent up the Yeates track it soon "flattened" out to be merely undulating as we made our way to Te Matawai Hut and a well earned early lunch. Debate ensued as to how long it would take us from Arete to Tarn Ridge via the Waiohine Pinnacles. Estimates varied between and optimistic 2.5 hours (Alistair), we'll be there at 5pm (Sarah) and a pessimistic 3.5 hours (Craig). Meanwhile, Murray remained non-committal. "You can only count time on the shoe". 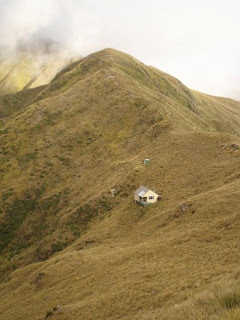 "Only if your name is Maui and you can slow the sun"
As we approached Tarn Ridge Hut the beard of Huey began to roll in. Still no sign of Huey flapping his broad, wind generating wings so all was good. And the time we arrived at Tarn Ridge Hut? 5pm. Must have been perfect weather!! At Tarn Ridge Hut we arrived to a bench stacked full of apparently abandoned food. After some short debate about whether to have rice or fresh potatoes with our Spiced Lamb for dinner, the fresh potatoes naturally won over, especially for Alistair and Murray who set about preparing the mashed potatoes to go with the meal. With so much food around, we had no choice but to help clean up the hut so we had a few tins of allegedly spicy baked-beans for as additional sustenance while we preparing the meal. As we sat down to eat our fine meal two torches began to shine outside the hut, as Alistair received the glare from wife Sarah as she said, "I told you!!" and Alistair being left with no choice but to respond "Yes, you told me" to avoid the otherwise inevitable repetition. All was quiet as Murray, removed the three LPG cannisters that he had "borrowed" from his pack and returned them to the bench. As Alistair was ready to apologise profusely, and offer our rice he quickly realised these were not hunters back to enjoy a huge meal at all. In fact, it was his mathematics lecturer from his varsity days and his partner. 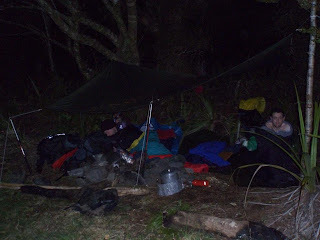 Stress was over as we continued to eat our meal as were heard about the travel down to the hut from Mitre in the dark. Not having a lot of distance to cover, we had a slight sleep in before Craig fulfilled his duty as trip leader and got the brew on. Our plan for the day was to walk over Girdlestone, up to Brockett. Drop our packs so that Craig & Murray could bag Mitre and Peggys Peaks and head down Table Ridge to Cow Creek. As a beautiful day had dawned Alistair proposed that we split. 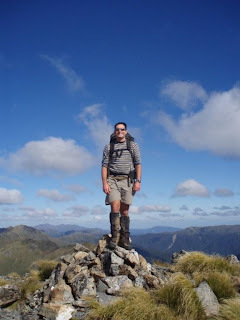 Craig and Murray would go over Brockett, Mitre and Peggy Peak with Alistair and Sarah heading over Adkin, the Three Kings and Baldy with us all arriving at Mitre Flats, by which time Craig & Alistair would have both completed bagging each of the peaks over 1500m in the fine Tararua Range. Sarah & Alistair had a bit more ground to cover so Craig & Murray gave them a short head start while they swept out the hut. It also gave Murray the chance to once again fill his pack with free LPG cannisters. Taking in the views it was an easy two hours up to Mitre, and about the same down to Mitre Flats Hut. Coming down from Peggy Peak was like SH1 with party after party on their way up the hill to bag Mitre Peak before dropping back down to the hut. Surprisingly, with all these groups walking past not one of them was completing a Northern Crossing in the reverse direction to ourselves. With plenty of time to burn as we were taking the shorter route, we took the time to speak to each party on their way through. Some appeared incredibly surprised at our distance traveled but we were happy to take the accolades whether deserved or not. I think these same people would be surprised how much ground they would cover themselves if they tramped a little more regularly. We arrived to a packed Mitre Flats Hut, with the best of the surrounding campsites already occupied. I told people our friends we arriving around 3pm and we'd probably head up to, or on the way to Cow Creek tonight. Come 3:30pm, with people asking me where my friends were I consulted the map briefly before remembering that Alistair wouldn't have left anytime for lunch. He can stop his watch, but not the sun after all. About 4:30pm, Sarah & Alistair emerged. Clearly too nackered to go any further, and a mere hour of daylight remaining we pitched a fly, and set about preparing another fantastic meal. Having personally mixed the spices prior to the trip himself, Craig was sure not to disappoint as the beans did on the preceding evening. Shortly before the meal was ready to serve, Alistair inspected Craig's cooking and said "Thats going to have some kick to it". Craig just smiled. Sarah instantly declared herself a curry wiss, and asked for extra cucumber riata to help wash it down. A sizable Kumara chickpea curry was served. Not only was Murray from a tramping club named after this fine mountain range but, he was our guest so we could not send him away hungry. We continued to load his plate up until he was ready to pop. Following our meal we talked to a few other trampers in the hut. Alistair saw someone-else wearing the head torch as he, and said "Hey, you got your headtorch from $9.95 from Placemakers like me". "It was Christmas present from my father". "Good value for ten bucks" said Alistair. We eventually noted this other headtorch had a couple of features Alistair was missing. Must have been at least $14.95, mate. Alistair mentioned the great value of his $9.95 Placemakers headtorch approximately another 237 times before we had, had enough and went to sleep. As is Tongue & Meat custom, trip leader stretched a good 40cm to start the brew and by 7am we were on our way on the track up the true right of the Waingawa River. It was fairly fast travel until three of us were attacked by wasps. Meat eaters those wasps, so all three of us fine Tongue and Meats were stung, while Murray was left alone. Following a quick break with an intake of antihistamines and sugar we soon picked up Peggys Stream, and followed it away from the track back into the Waingawa River. A scramble up the bank on the other side and we were on our way up the Donald Spur to Te Mara. It seemed as though Murray has done the least compass work prior to this trip. We loaned him a map and compass and designated him as chief navigator as we we made our up to join the Blue Range Track. It was good and quick travel even without a marked route up this bush covered spur, although near Te Mara there is a lot of plastic tape and some old permalats leading back to the Blue Range Track. The Blue Range track was broad and easy. We had a bite to eat and waited for our taxi at Kiriwhakapapa. And waited. And waited. Uh oh! We asked some campers if they could give us a lift, "Sorry, we've been drinking too much to drive" and some others said sure we're just packing up. Our observations were, perhaps by midnight. We started walking in search of phone. Every property seemed unoccupied and for sale. Thankfully we found someone working on their lifestyle block. "We haven't moved in yet so we do not have a landline". We were offered a ride which we naturally accepted. Once back into Masterton, and cell phone coverage Craig discovered he had three voice messages from the taxi company which were of little use from the valleys of Mitre Flats and Kiriwhakapapa. Still, it was a fine trip and we found our way back to Masterton rail without too much difficulty.